Through a series of statements, tennis’s governing bodies (the Women’s Tennis Association, the U.S. Tennis Association, and the International Tennis Federations) are staking out their positions on the sad and entirely avoidable debacle that was the U.S. Open women’s final. 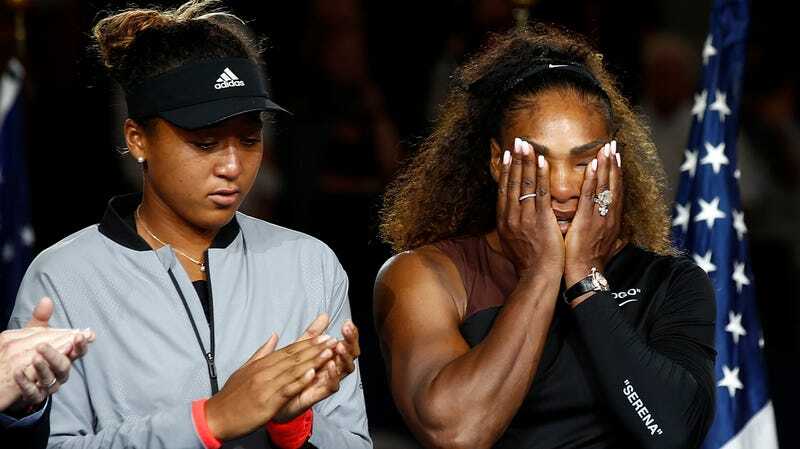 After 20-year-old Naomi Osaka won the match on Saturday, USTA president Katrina Adams released a statement praising Serena Williams for her sportsmanship. “We watch the guys do this all the time, they’re badgering the umpire on the changeovers. Nothing happens. There’s no equality. I think there has to be some consistency across the board. These are conversations that will be imposed in the next weeks. “I know what Serena did and her behaviour was not welcome. A line could have been drawn, but when you look at Carlos in this situation, it’s a judgment call to give that last penalty because she called him a thief. They’ve been called a lot more. Yesterday, WTA CEO Steve Simon (who earlier this summer carelessly discussed a Williams doping test on the phone at a public airport, thus launching weeks of scrutiny into Williams’s drug testing history), released a statement decrying the double standard of umpire calls. “Yesterday’s US Open final resulted in the crowning of a deserving new champion, Naomi Osaka. The WTA applauds Naomi for her tremendous accomplishment. “Yesterday also brought to the forefront the question of whether different standards are applied to men and women in the officiating of matches. The WTA believes that there should be no difference in the standards of tolerance provided to the emotions expressed by men vs. women and is committed to working with the sport to ensure that all players are treated the same. We do not believe that this was done last night. “We also think the issue of coaching needs to be addressed and should be allowed across the sport. The WTA supports coaching through its on-court coaching rule, but further review is needed. With the USTA and WTA so firmly in Williams’s corner and the ITF backing Ramos, we can all continue to fight about the match and who’s to blame.